Stock ROM is used to update the Android system on your ASUS Zenfone 4 Selfie Lite (ZB520KL) device, whether it's an update in the Bug fix (defect) or the addition of new features to the ASUS Zenfone 4 Selfie Lite (ZB520KL) Android system. Stock ROM updates usually function to stabilize and speed up the performance of the Android that is used as the operating system on the ASUS Zenfone 4 Selfie Lite (ZB520KL) device. So, Update Stock ROM is a good thing to do if you want the performance of your ASUS Zenfone 4 Selfie Lite (ZB520KL) device to be better than before. With bug fixes on your Android system on your ASUS Zenfone 4 Selfie Lite (ZB520KL) device it is an effort to minimize damage such as Bootloop, Stock in Logo, Brick and other system damage caused by viruses or the fault of the Android system itself. Therefore, updating Stock ROM is a must for you Android device users like ASUS Zenfone 4 Selfie Lite (ZB520KL) if you want your ASUS Zenfone 4 Selfie Lite (ZB520KL) device to be protected from system damage. To update Stock ROM, there are usually two ways you can do, the first way is by "Auto Update" and the second "Manual Update". You can do both ways by following step by step in the post "How to Update Stock ROM ASUS Zenfone / Zenpad Devices". But, for "Manual Update", you need a ZIP file from Stock ROM that is suitable for the ASUS Zenfone 4 Selfie Lite (ZB520KL) device you are using. Therefore, in this post, I provide a ZIP file from Stock ROM that you can use to update your Android system from your ASUS Zenfone 4 Selfie Lite (ZB520KL) device. To get all the Stock ROM from other ASUS Zenfone devices, then, you can find it in the post "Download Stock ROM ASUS Zenfone (All Models)". In some cases, damage to the Android system on ASUS Zenfone devices such as Bootloop, Stuck in Logo, Brick and other damage requires handling that is more than just Update Stock ROM, namely Flash Firmware. If the condition of your ASUS Zenfone device does require Flashing Firmware, I have also provided a RAW file from ASUS Zenfone Firmware that you can use to repair the Android system from your damaged ASUS Zenfone device. RAW firmware for ASUS Zenfone devices, you can get a post "Download Firmware RAW ASUS Zenfone All Models". And if you need to install an ASUS USB Driver, you can get it in the post "Download ASUS Android USB Driver (All Models)". 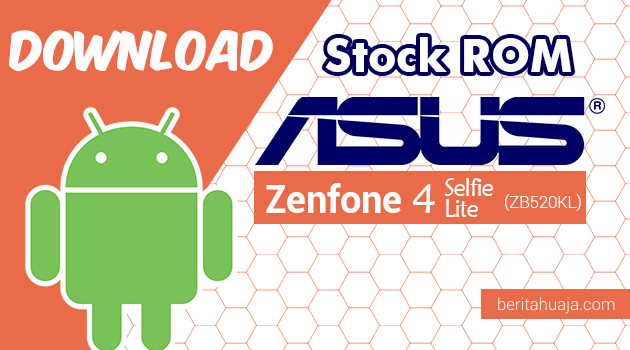 0 Response to "Download Stock ROM ASUS Zenfone 4 Selfie Lite (ZB520KL) All Versions"